We recently caught up with Sky Solbach, who works extensively with North Product Development. 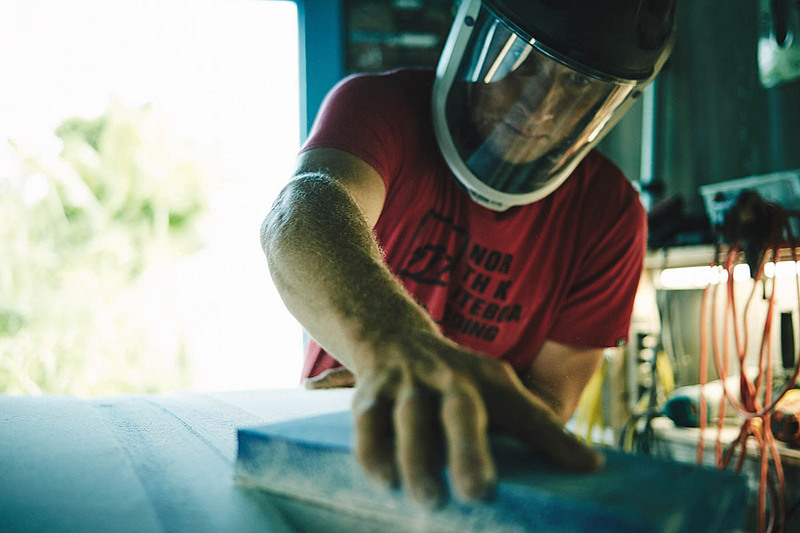 Sky helps design and test many of the North Kite range, however his main passion with North is Surfboard shaping, design and testing. Hello Sky! 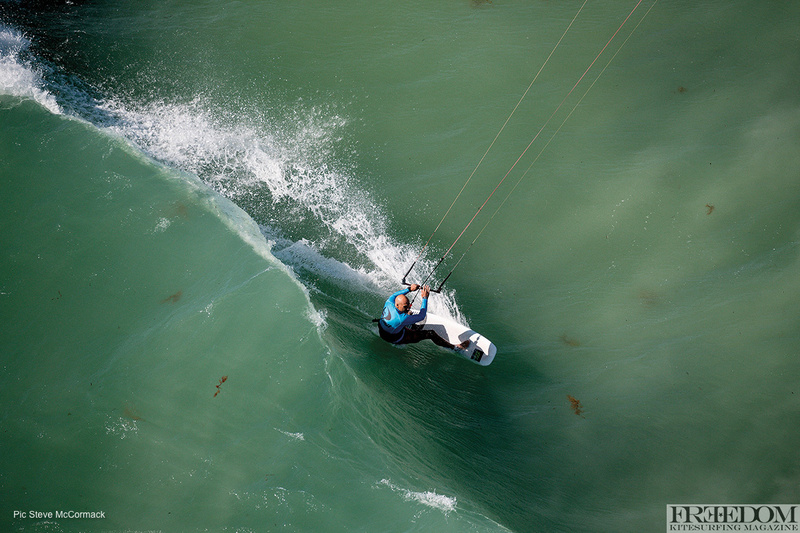 What’s your involvement with North Kiteboarding? I design and shape and follow up with production for North as well as for the surfboards and for the kites. I work together with Ken Winner. We have two kite designers, but I work mostly with Ken. Ken and I designed four different kites together. We designed the Neo, the Rebel, the Juice, and the Mono. So, I had quite a bit of input on those kites. But my main thing is the design and manufacturing of surfboards. Our most popular board right now is the Pro CSC. It’s a compact shaped board. Snub nose, squashed tail. What kind of conditions are you looking to ride this board in? It’s an all-rounder, small to medium waves is how we market it. The Pro CSC, you can ride it in a bit bigger surf and it handles very well. It’s a pretty small to medium surf, all-rounder and freestyle strapless board. With the Pro CSC, in particular, we have a couple of different constructions. The Pro CSC, has a light team construction which doesn’t have foot strap inserts. It has its own unique construction so it’s more of a pure surf-style board. 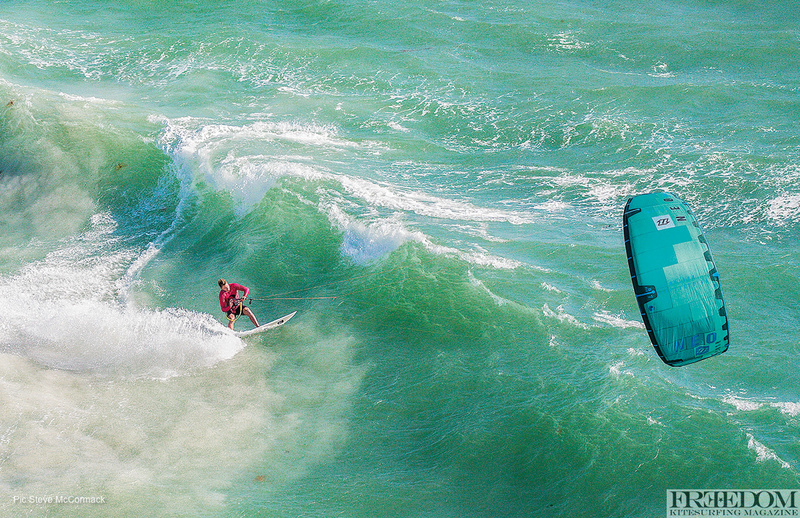 AUSSIE JAKE GORDON WAS RIPPING AT THIS YEAR’S LANCELIN OCEAN CLASSIC ON HIS NORTH PRO CSC DIRECTIONAL. THIS UNIQUE ANGLE CAPTURED FROM THE CHOPPER! When you take out the inserts, especially for a strapless, it makes the board so much lighter and more responsive. Yeah, it takes out weight, but also, funnily enough, we can remove a lot of the reinforcements where your heels are. It makes the board lighter and stronger at the same time because you don’t have the ridging effect over the inserts. Any time you put a hard object in the middle of a board that’s supposed to flex, it flexes around that hard spot and can lead to breakage. So, we have to beef up that area – not just because you’re standing there all the time, but because it ridges over those hard inserts. What else in your surfboard range is doing well at the moment? Well, for that style of board, it’s pretty much the Pro CSC and the Whip. The Whip is kind of similar to the Pro CSC, but it’s got a little bit of a wider tail and it’s more geared towards smaller surf. It doesn’t handle quite as well when it gets bigger. Shape-wise, it’s aimed towards smaller surf, but it has a different construction, so that kind of separates it. It has foot strap inserts, it’s a little bit heavier and a little bit more robust. SKY SOLBACH CAN SHAPE A MEAN BOARD AND CERTAINLY KNOWS HOW TO RIDE TOO! Is this a good surf freestyle air board as well? Yeah, it’s a great. The North team really like it for freestyle. The wide tail gives it a lot of pop, that’s what the team riders are telling me. So that actually changes your pop, the wider tail design? Yeah, in that case it does. It really depends. It depends on the rider, too. Some guys like a narrow tail that they can really sink and dig in, that also gives them pop, but then it depends on your style of riding. A team rider like Matchu really prefers the wide tail because he’s a little bit lighter on his feet and he’s not super aggressive. Matchu is really tall and lanky, so he has more of a finesse style. So for Matchu, he likes the wider tail and says it gives him more pop. I’m a little bit more of a traditional surfer. I like the pointed nose, rounded off or square tail. What kind of board would I be after then? I still like to do strapless airs, but I’m a little more keyed into the waves. Well, we basically have two different models. Well, kind of three, but we have different constructions, so it kind of separates them. If you’re an average customer who wants to have foot strap inserts, then you’d probably go for the Wham. The Wham is our all-round, traditional style, pointed nose, squashed tail board – the works. If you’re more oriented towards strapless riding, you’d probably go for the Pro Surf, which is the same thing basically. It has a slightly different shape and a the tail is a little more pulled in. It looks like the Pro Surf has got the light construction too. Exactly. It’s got the light construction, no foot straps inserts. 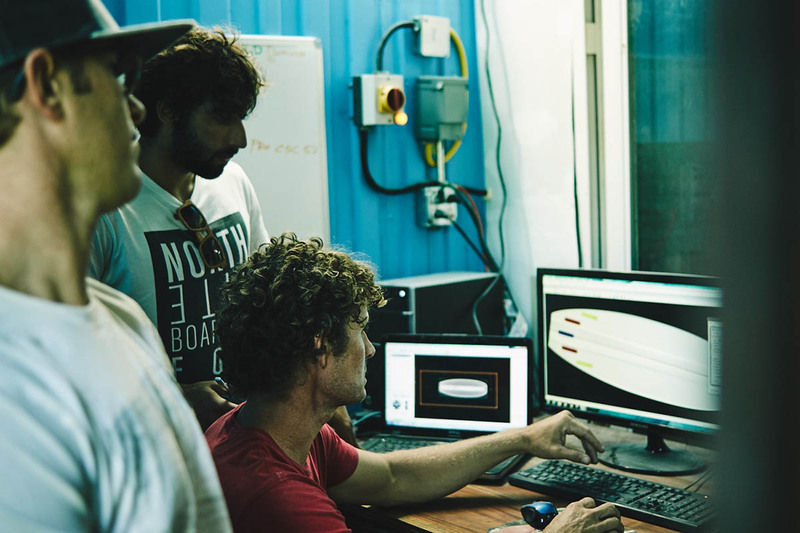 It’s the go-to high performance all-round board for the team riders. That sounds like my kind of board. Then we have another board, which is a step up from the Pro Surf. The Pro Session isn’t necessarily a big waves board, but if the waves are a little bigger, it’s more carve-y. It doesn’t have the fins-free kind of feeling, it stays more connected to the face of the wave, it’s more carving oriented. The team riders really like it for faster waves. So it’s a little bit more narrow? It’s actually almost the same width in the centre, but it’s got a really pulled in round pin tail. It’s almost a bigger wave gun that’s shrunk down. We’ve chopped the nose off a longer gun and then shrunk the whole thing down. So the wide point has moved a little bit forward. If you have a really nice open faced wave where you can really lay into turns, it’s a really fun board to have because it stays really well connected through the turn. It doesn’t release as easily as the other boards. The Pro Session really carves. Awesome. Tell me about the Neo Kite. 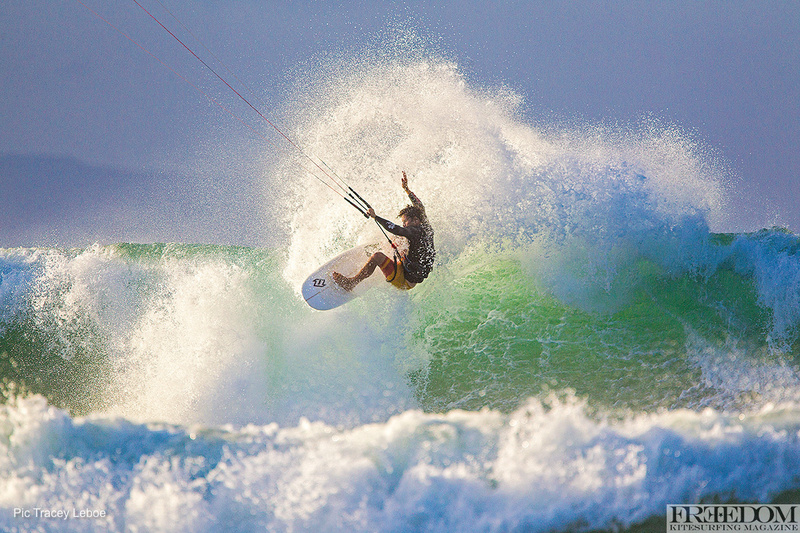 The Neo is our pure wave-type kite. It was developed completely 100% for wave riding. The Neo used to not be that way actually, we took the design over from the other designer 3 or 4 years ago. At that stage, it really became the full on wave kite. So we’ve designed performance aspects like quick steering, really good drifting ability and no backstalling. That’s important when on a wave. Yeah and really good relaunch and durability. All of the these aspects make the Neo a good wave kite. So we went down the wave kite checklist and the kite has progressively gotten better every year. It’s actually become one of our best selling kites, if not our best selling kite right now. So, the way you market it, North say you can use 1 to 2 square metres less than what you would normally ride? Yeah, that’s kind of the end result of the profiles we are using. It just has a lot of power and just where the Neo sits in the wind window, it develops a lot of power. Also the steering is so fluid and no matter where you put it you can generate power and there’s no delay in the steering. Even on your bottom turns and top turns you have good power? Exactly. Pretty much wherever you put it in the window you can generate power. You can also spill the power if you let the bar out, but if you’re looking to generate power, it’s really a sheet-and-go kind of kite where you can sheet in and sheet out to get power. The Neo has more dynamic power, we call it, where you can swing the kite up and down and actually generate quite a bit more power than other kites. So the Neo is great for waves and you want to be on as small a kite as possible so you have maximum manoeuvrability. Also, it doesn’t cost you as much because you can buy smaller kites!